"It's nice to have The Reference Library rounded off with this tenth edition. This set of ten books should be on the shelves of all Sherlockians." 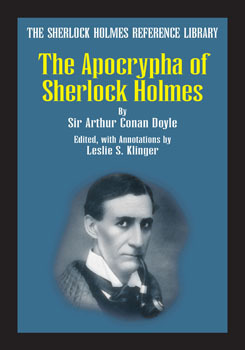 "Just when we though Les Klinger was done annotating things Sherlockian and the applause for The Sherlock Holmes Reference Library was starting to fade, he came back to the stage with his collection The Apocrypha of Sherlock Holmes, as much a true encore as anything you'll see in the world of books. You'll definitely want to include it in your library. This is one encore that works." "We're indebted to Mr Klinger for the light he throws on these addenda to the Canon; his scholarship is, exemplary." Gasogene Books is proud to announce the FINAL volume of The Sherlock Holmes Reference Library. Arthur Conan Doyle wrote more adventures of Sherlock Holmes than are contained in the sixty tales. This deposit of extra-Canonical material is known by Sherlockian scholars as The Apocrypha. No other annotated edition includes these important writings. Only now, in The Sherlock Holmes Reference Library, is the Canon truly complete. The Apocrypha of Sherlock Homes is one volume of The Sherlock Holmes Reference Library, an exhaustively annotated, ten-volume edition of the Sherlock Holmes tales. It's the most complete collection of Sherlockian scholarship and commentary ever assembled. No Sherlockian bookshelf is complete without it. Each illustrated volume is bursting with scholarly annotations and features a sturdy, smythe-sewn soft cover binding. The Apocrypha of Sherlock Holmes.